GSMArena team, 21 April 2017. Samsung really pulled out all the stops in the S8 and S8+ specs department. Nothing but the best, which in this case is the current pair of flagship offers from both Qualcomm and Samsung's own silicon divisions. Of course, we are talking about the Snapdragon 835 and the Exynos 8895 - both built on a cutting-edge 10nm manufacturing process. In fact, word on the street is that the Korean giant might have been so enveloped in its quest for ultimate mobile performance that it actually hoarded all the initial Snapdragon 835 stock. This, allegedly, caused LG to resort to a Snapdragon 821 for the G6 and might have also forced Xiaomi to postpone the Mi 6. But at this point these are just speculations, of course. Samsung claims there is virtually no performance variance between the pair. Both chips have a total of eight cores - a pretty standard setup. Qualcomm has its custom Kryo 280 cores working at 2.35 GHz. These do have a bit more wiggle room in terms of maximum frequency (2.45 GHz, as rated by Qualcomm), but this is what Samsung decided to go for. 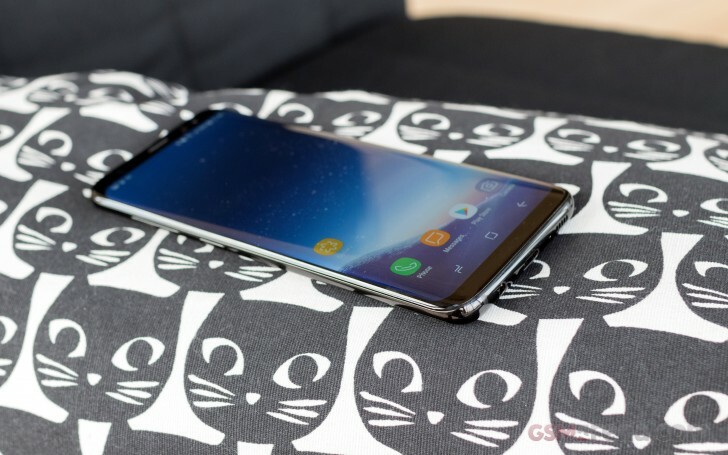 As for the Exynos 8895, it has four of redesigned M1 "Mongoose" V2 custom cores, clocked at 2.3 GHz and a less power-intensive cluster of four Cortex-A53 units, at 1.7 GHz. There are some differences in the graphics department as well: an Adreno 540 on the Snapdragon 835 and a Mali-G71 MP20 on the Exynos 8895. We've tested both the Exynos and the Snapdragon version of the S8+, and we'll now compare to the Exynos-powered S8, 4GB of RAM each. So, let's dive in and kick things off with GeekBench 4, where the Galaxy S8 appears to be tuned slightly differently. While it matches the Exynos S8+ in single core tests, it's a notch slower in multi-core, though still ahead of the Snapdragon S8+. The Kirin 960 in the Huawei P10 is almost a perfect match in single-core, but can't keep up with all cores running. The iPhone 7 is still in a league of its own in terms of single-core output, but it holds them back in multi-core. Anticipating some possible confusion with Galaxy S8 results from various sources over the next few days, we would like to offer some insight on the current GeekBench situation. At the end of last month, the popular benchmark suite was updated to version 4.1. It changed quite a few things and as per the developer's own accounts, users can expect increases of up to 2% in single-core and 5% in multi-core scores. That means that results between GeekBench 4.0 and 4.1 are no longer directly comparable. We have decided to do the fair thing and publish the older and comparable GeekBench 4.0 scores instead. Moving on to some compound benchmarks, Basemark OS II 2.0 puts the S8s at the top of the chart - well, in the Android world at least, as the iPhone 7 is still a few points ahead. It's pretty much the same story in Antutu 6, where the iPhone 7 snatches the victory by a tight margin. The S8 posts virtually identical numbers to the S8+, both in Exynos trim, while the Snapdraggon S8+ is a tiny bit behind. Things aren't quite so clear-cut on the graphics side of things. The Mali-G71 MP20 is a true mobile graphics powerhouse, no question about it. It brings about the sort of power that will probably make console-grade gaming experiences possible on mobile down the line. There are a few things to consider when analyzing the Mali-G71 MP20, as implemented inside the S8 and S8+. The main one, of course, being resolution. The new ultra-wide aspect ratio means about 576,000 extra pixels on top of QHD the GPU has to render on. There is also the matter of proper support from game developers. Currently, Samsung is forced to play the middle-man between game engines and its new screen aspect ratio, offering both straight-forward support for the resolution, as well as resizing, fitting and cropping assistance. The latter is an imperfect solution and can sometimes lead to graphical errors and glitches - yet another batch of hurdles that early-adopters will have to endure. However, it's not all that bad. Even today, many titles already support the wider aspect natively. Others scale and crop without any issue. We are happy to report that we couldn't really induce a crash in any game we tried but on the other hand we didn't try that many. The worst problems we managed to end up with are slightly cropped out controls around the very edges of the game interface and a few extra screen flashes while loading. All were pretty isolated and we can only expect improvements going forward. As for actual on-screen performance, it quite understandably suffers a hit due to the lavish new resolution. Again, we will remind you that these are synthetic tests and any self-respecting game nowadays has the ability to scale back in quality or detail gracefully to ensure proper performance. The Galaxy S8 is a truly amazing gaming device and a pretty future-proof one as well. These Open GL ES 3.1 scores definitely speak for themselves. Much like the Galaxy S8+, the small S8 is hard to fault for performance in any area - it sets the standard, really. The few minor differences we observed, compared to the S8+, can very well be attributed to the margin of error between units and test runs.